Finally! A Book About Grierson's Raid! I have been enjoying much of the coverage the Western Theater of the American Civil War has been gaining as of late. With the plethora of works coming out that are paying attention to this conflict, there has been little of that attention paid to Benjamin Grierson’s Raid. Most of those mentions come within the body of larger works and it is not fully described as much as I wanted it to be. The Real Horse Soldiers, by Timothy B. Smith is such a work that I have been waiting for. This book details everything about this raid and even more so, it gives the reader a deeper understanding of the Western Theater as a whole during the year of 1863. Timothy B. Smith is a professor at the University of Tennessee and has authored many articles and essays. He also has a number of previous works under his belt including Champion Hill: Decisive Battle for Vicksburg, Rethinking Shiloh, and Corinth 1862. He received the Fletcher Pratt Award for and the McLemore Prize for Shiloh: Conquer or Perish. He also won the Tennessee History Book Award for Grant Invades Tennessee: The 1862 Battles for Fort Henry and Donelson. Timothy B. Smith has also served for the National Park Service. To fully understand Grierson’s Raid, there must be a study wholly devoted to it, something Civil War Academia hasn’t had for some time. This book not only gives us an insight into how the plan was formulated, and how it all began, it is laid out for the reader in an interesting way. While reading this book, it almost felt like a thriller in many ways. There were even points where I felt that it read like a heist novel. It is that type of engaging writing that makes me glad that a book like this exists. It is informative without being too dry. But the book is not just about the exciting narrative, though it does help. This book gives us what we needed: a study on the raid itself. It was interesting to see the mindset of the man as he reached difficulties throughout the plan. But I would be remiss if I did not mention the attention to detail that Smith gave to the Confederate side as well. There were frustrations on Grierson’s part of not completely finding out where the enemy’s position was in certain portions of the book, and it is shown when describing the opposition here. Pemberton seemed like a force to be reckoned with, but in the end, Grierson overcame them all. When I finished reading this book, one thought immediately came into my mind. Why are there not more works about this raid? It seems like an event in the Civil War that should be talked about more often, but it is glossed over. In other books about the Western Theater during the year of 1863, there are only mere mentions of how it aided in the cause, but a serious work was always lacking. That is one of the reasons that I recommend this book one hundred percent. I don’t only recommend it for the readers of the Western Theater, I recommend it all Civil War enthusiasts. This is a part of the war that should not be forgotten and I thank Timothy B. Smith for writing this work. I am glad to say that there is a well researched work on Grierson’s Raid that we can go to and I can see this becoming a classic. If you look around the Civil War world of study, you will always find people asking questions on the abilities of leadership, the possibilities of other generals in the position of those who failed, and the overall demeanor of them. These are questions which often time fuel the overall study of the war itself and force critical thinking when it comes to overall strategy, tactics, and generalship. Challenges of Command in the Civil War is a book that takes some of those thoughts into question by evaluating generals, mainly Ulysses S. Grant and Robert E. Lee, and analyzes their performances, and the ways in which they gained their reputation. And while this book might not deal with the “what ifs” of other commanders in the position, it does point out some of the criticism which these commanders faced at the time of their leadership. Dr. Richard J. Sommers has written a number of Civil War works throughout his illustrious career. He has authored more than one hundred books, articles, etc. on the subject, one of his most famous works being Richmond Redeemed: The Siege of Petersburg. He has garnered the Harrisburg Civil War Round Table General John F. Hartranft Award “for meritorious service,” and the Army War College has recognized him as a “Distinguished Fellow.” He served as the Senior Historian of the Army Heritage and Education Center until 2014. He teaches at the Army War College in Carlisle, Pennsylvania, and he gained his Bachelors at Carleton College and his Ph.D. at Rice University. As someone who reads a decent amount of Civil War books, there was one thing that stuck out to me in Sommers’ book, Richmond Redeemed. For one, he seemed to understand the nature of command and leadership unlike others who have tackled the Petersburg Campaign. But more than that. He took some of those commanders who have been deified in our culture and made them human. He continues that tradition in this first volume of Challenges of Command in the Civil War. The first portion of the book handles the careers of both Grant and Lee throughout the war, and their rise to that power. In his chapter on Robert E. Lee and the war in the east, Sommers makes a point that Lee overall failed not because of the fighting force which he had, but because of the foe in Grant, the man who would push him to the brink. He also credits the fact that the country could not handle the other failures around him as a reason for the inevitable end of the war. Grant is also analyzed in ways that were different than usual. Most usually handle Grant as the man who grew to great prosperity in the west and came to the east as a savior, but that was not wholly the case. Sommers mentions that Grant had his critics both before and after his relocation to the east. Of course, this first section of the book shines when Sommers begins his study on the Petersburg campaign and the generalship of the two there. I appreciate the detail he always places in that campaign; he even mentions that there was a great deal of importance there as the zenith of the Virginia campaign. Now I don’t want to give the wrong impression here. This book is not just about Grant and Lee. The second section of the book handles the other generals in this American drama. Sommers takes a look at the rise, and sometimes fall, of some of these generals both in blue and gray, but more so focused on the blue since there was more fluctuation within the ranks. Portions focus themselves not only on the generals overall, but their roles in Antietam and Gettysburg. I find that his chapter on Gettysburg commanders within the Army of the Potomac pinpoints some of their finer nuances of structure, along with the controversial as well. I enjoyed the portion of the chapter that handles characters such as Sickles, Howard, and Doubleday as having difficulties while praising the leadership of Hancock. There is even a chapter chronicling the generals at Petersburg under Grant. By the time I reached the end of this book, I thought I had gained enough knowledge about these Generals and how they handled their command, but there was one last bit left in store for me. I found his chapter on Revolutionary War Relatives of Civil War soldiers to be fascinating. This is a constant study which I find all over the Civil War realm and to have a detailed section on this analysis just added a little bit more to the fine points of this book. In the end, there is little more that I can say about this book that I already mentioned. There are some books out there that handle the subject of generalship but this one, overall, is a fascinating study. I find it to be highly accessible and a great read, especially for those who are starting serious Civil War study, and Sommers writes with such narrative that you often feel you are there on those battlefield with him as your guide. I highly recommend this book to any interested in the Civil War. For avid readers of Civil War academia, the name Bradley M. Gottfried is synonymous with his atlases of battle. I remember the first time I picked up The Maps of Gettysburg and was amazed at the detail and narrative which went along with these fine maps. As my life continued as a Civil War reader, I saw the number of other campaigns Gottfried covered, and part of me even hoped that he would cover all of the major campaigns within the conflict. Today, we will be looking at The Maps of Fredericksburg, yet another entry into his fine collection of atlases that continues to aid readers into an understanding of this war. Dr. Bradley M. Gottfried obtained his Ph.D. in Zoology from Miami University and worked in higher education for the better part of forty years. He is also a board member of the Central Virginia Battlefield Trust. He has authored Stopping Pickett: The History of the Philadelphia Brigade, Brigades of Gettysburg, Kearny’s Own: The History of the First New Jersey Brigade, and many others. Most notably is his atlas series which is comprised of The Maps of Gettysburg, Bristoe Station and Mine Run, and The Wilderness, along with others. 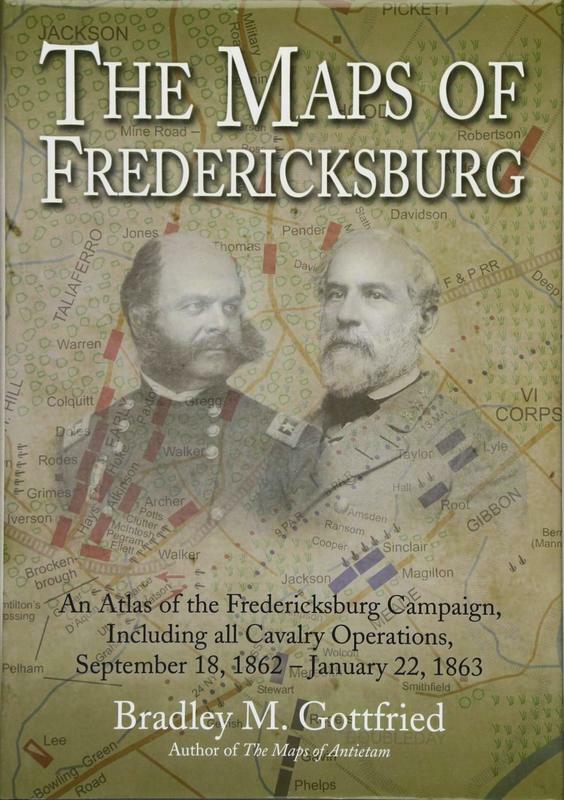 Much like his other works in the atlas series, The Maps of Fredericksburg sets aside some time for the pre-battle situations that shows the reader movements towards the fateful place which is immortalized. The Maps of Fredericksburg have a number of these map sets which show the movement that brought armies towards the town. We have sets concerning the movement of McClellan before Lincoln makes a change in command, we have maps of army movements when Burnside takes command, along with the setting before the fight begins. Now these were in all Gottfried’s previous works, but this one seemed a bit more extensive, mainly due to the interesting political situations the Union was placed in. His descriptions of the Confederate movement even details Stuart’s ride around McClellan’s force. Overall, the five sets of maps which bring the reader to the opening shots of the battle, are well made, but it was the narrative that kept everything flowing. This included the building of the bridges which crossed the Rappahannock, and the scouting which Barksdale had accomplished while the Union was constructing it. This also included portions where commanders of the Confederate force were informed to warn the people about the upcoming fight. All of this is told through the excellent narrative we have come to expect from Gottfried. When the maps of the battle come into play, the details that surround them are quite interesting. We have the opening shots that explains the movement through the town of Fredericksburg, and we have the many waves of attacks that were delivered upon Marye’s Heights,. We even get a taste of attacking the right of the line, where much of the action of General Jackson took place. I have to admit that Map Set 8 through 12 are one of my more favorite parts of this book, mainly due to the attention that Jackson gets in his fight against the Union. Overall, I have to say that this book not only stands out to me as a great atlas of the battle, but as a great narrative as well. That is one of the reasons this series stands out to me. It’s not just about the maps, it’s about the research and narrative which accompanies them. I highly recommend this book to anyone interested in the Civil War. Even though it only focuses on the one campaign, I feel like this addition to Gottfried’s atlas collection would benefit any reader who wishes to know more about the conflict of the Civil War as a whole. I feel that way because of the staggering losses which the Union army obtained in this campaign. Fredericksburg continues to be a point where many Civil War authors draw from, and while they may not write about the campaign, it is often mentioned. As for the addition to the atlas collection, this volume is a must have in any Civil War library. The amount of details, research, and overall care that went into this work shines and Gottfried should be applauded for this continuance of his work. I look forward to the next volume of maps he produces. Highly recommended. There is something essential to primary sources as we study the American Civil War. And yet, when we look at those sources, especially with those who served in the military, there are some who say that we should take what they claim with a grain of salt. However, the same cannot be said for some of the primary sources which come from the civilian end of the American Civil War. There is something sincere about them, something which screams truth at the reader. The War Outside My Window is one such work that, to me, had a great deal of truth to it. Edited by Janet Elizabeth Croon, this work is one which every Civil War Scholar should take a look at. Janet E. Croon graduated from the University of Illinois with a Bachelors in Political Science, Modern European History, and Russian Language and Area Studies. She also holds a Masters Degree from the University of Dayton in International Studies. For twenty years, she has been teaching International Baccalaureate History and as she lives in northern Virginia, she has gained a great interest in the Civil War. As of this review, this is her first book. The War Outside My Window chronicles the diary of LeRoy Wiley Gresham during the American Civil War. We learn much about his lifestyle and family as the dates go by throughout the book, learning that he had come from a slaveholding family in Georgia. Mainly living as an invalid, he had leg and back injuries, but was educated and quite witty at times. He began this journal as secession started to take place and his own observations proved quite interesting as he saw what this conflict was going to do, not only to America, but to the world as he saw it. For a young boy of twelve years old, his scholarly pursuits and educated readings truly came out in his writing as the war went on. Not only were there poignant statements about what was happening to the world that he knew, mainly the slaveholding south, but his health which was constantly in decline. Much of that enters his writing which shows that he had maturity to pen such horrid thoughts about his life and how his declining health was getting the better of him at times. But what I took the most from this source was the interesting dynamic of the loss of his way of life, the concerns which the family had over the outcome of the war. His words truly brought life in the Civil War south to life for me, especially coming from such an affluent family such as his. It’s books like these that leave a stamp on you, and The War Outside My Window will always remain in my mind. I’m not sure what else I can say about this book. It’s truly a great insight into the mind of a child as the world he knew was crashing down. I highly recommend this work to anyone interested in the Civil War, especially if you are interested in the civilian life. The work which Janet Elizabeth Croon accomplished here should be praised and remembered for ages to come. Not only does she give us that proper look into the life of the civilian in the South, she adds on top of that the outlook of a young teenager. This is not to be missed. Highly Recommended! There are certain volumes within Civil War scholarship that are well known to the masses, and some campaign specific studies tend to go along with that notion. The Generals of Gettysburg is one of those well known books specifying itself on intense campaign study. Now, Larry Tagg has offered a new study much in the same vein as The Generals of Gettysburg but with a different campaign. The Generals of Shiloh is a new work that gives the reader information regarding the commanders of the previous mentioned engagement and their actions while there. Once again, Mr. Tagg has given us a fine reference book that will be remembered and used for scholarship for the Shiloh Campaign. Larry Tagg graduated from the University of Texas and is well known as a bass player and singer. He co-founded “Bourgeois Tagg” and enjoyed great success with the group in the mid 1980s. He also played bass for Tood Rundgren, Heart, Hall and Oates, and other musical groups. He has also taught High School English and drama while in Sacremento at the Humanities and International Studies Program. He is also the author of The Generals at Gettysburg and The Battles That Made Abraham Lincoln. As stated in the introduction, The Generals of Shiloh is a fine reference book to the campaign that any student, or even master, of Shiloh should own. The format of the book is much like its predecessor and allows an ease of use to the researcher. As a book to read, some of the biographies of the commanders are quite interesting. Some of the commanders are well known while others have flown under the radar for years. That, in my opinion, is one of the nice things about this book. The war in the west has often been too ignored by many and therefore, many of the commanders who fought in this engagement are often too easily forgotten. Tagg, by using this format he used in his Gettysburg book, has brought to light some of the more interesting characters of this war I have only briefly read about. On top of the biographies about the generals, there are many sections in the book that give details on the army and brigade level of what occurred during battle. Right after the biography of the commander is a narration as to what their branch performed during the conflict. There is no doubt in my mind that this book gives me a larger appreciation for the Battle of Shiloh. I highly recommend this book to anyone interested in the War in the West, in particular, the Battle of Shiloh. The format gives many researchers and ease of use and if one is going through the text to read it, they will find some fascinating, well written narrations of what occurred at this conflict. Overall, I hope to see more books like this in the future from Mr. Tagg and some of the other major battles throughout the Civil War. Highly recommended! As many who tour the battlefield notice, there are a number of signs delineating where the field hospitals of Gettysburg were located. However, while there have been a number of books talking about the field hospitals of Gettysburg, they usually focus on a few of the locations and what they did there. In A Vast Sea of Misery, Gregory A. Coco chronicles the location of each field hospital and some of the interesting cases which came from them. In this printing of Coco’s work, the reference of the field hospitals throughout the town are a welcome sight to see back in print once again. Gregory A. Coco lived in Gettysburg for nearly thirty-five years. He served in the United States Army and also earned a degree in American History from the University of Southwestern Louisiana. While he was in the army, he served as a prisoner of war military interrogator and also served as an infantry platoon radio operator with the 25th Infantry. He received the Purple Heart and the Bronze Star. While living in Gettysburg, he served as a Park Ranger for the National Park and was a Licensed Battlefield Guide. He has written many other articles and books on the Civil War, but his most famous is A Strange and Blighted Land. Gettysburg: the Aftermath of Battle. This book is separated into six parts all chronicling the field hospitals throughout Gettysburg. The first is the hospitals in the borough of Gettysburg, the second is the Union controlled hospitals, the third is the Confederate controlled hospitals, the fourth are other important medical sites, the fifth being the field hospitals of nearby towns, and the last being Camp Letterman. Overall, the entirety of the book is comprehensive when it comes to the study of what these hospitals performed. Going through the text are intricate details on the location of the hospital, who served there, who most likely was healed due to regimental position, and even a short narrative on what happened. In the end, what I’m getting at is, this is one of the most comprehensive books on Gettysburg hospitals I have ever read. Since this is a new printing of the book, I should mention that I had not read the first edition since I could never seem to get a copy. But this printing of the book is quite gorgeous, just as well done as Savas Beatie’s reprint of A Strange and Blighted Land. Even after the six parts are completed, the appendices are something to behold as they are a wealth of even more information. I highly recommend this book to anyone interested in the Battle of Gettysburg. Especially since the new printing is out, the accessibility of this work has reached even more than before. I will forever enjoy this reference material of the medical work which was done in the aftermath of battle and I thank Gregory Coco for writing it. While A Strange and Blighted Land is his most famous work, I find A Vast Sea of Misery to be just as important and a great companion book to the former. Highly Recommended. One of the facets of the American Civil War which people tend to gravitate towards is the immigrants who served in the army during the conflict. One of the nations which seems to get a great deal of attention for their service is Ireland, but according to research, the German nation brought more immigrants to armed service for the Union. However, in my reading, I have not yet found a book which signifies their service quite well. While Under the Crescent Moon talks more about the service of the Germans in the Civil War, it is a book surrounding the Eleventh Corps which was heavily German during its year in service. James S. Pula is a professor at Purdue University Northwest. He has authored more than two dozen books including For Liberty and Justice: A Biography of Brig. Gen. Wlodzimierz B. Krzyzanowski, and The Sigel Regiment: A History of the 26th Wisconsin Volunteer Infantry 1862-1865. He is also the editor-in-chief of Gettysburg Magazine. He has received the Gambrinus Prize in History from the Milwaukee County Historical Society for his work on that book. He has also received honors from the Oskar Halecki Prize, the Rudewicz Medal, and the Officer’s Cross of the Order of Merit of the Republic of Poland. I highly recommend this book not only to students of the Civil War in the East, but the Civil War in general. I have not yet come across a well written and researched book on the Eleventh Corps and I applaud James S. Pula for doing so. I do hope that with the release of the second volume that many of the myths and misstatements about the corps get put to rest. There were a great many deeds which these people accomplished and Pula has brought them to light. Accompanied by excellent maps and photographs, this is a book not to be missed. There are many military leaders of interest in the American Civil War, yet one who seems to garner a great deal of attention is Nathan Bedford Forest. He is one of those characters of controversy, even to this day, but to me, one of the more interesting parts about his participation in the war is his rise in the ranks from the onset of the conflict. And there are even points in the book which prove how his actions and encounters shaped the Western Theater of the war. John R. Scales, Brig. Gen., U.S. Army (Ret. ), brings to life some of the points throughout Forrest’s life, especially the campaigns he fought during the Civil War. John R. Scales is a returned Brigadier General of the Special Forces. He has served for three decades, including tours in Vietnam and Afghanistan. He has a Ph.D. in engineering and has worked in that field since retiring from the military. He has written two previous works: Sherman Invades Georgia, and A Reluctant Hero’s Footsteps. He is a past president of the Tennessee Valley Civil War Rountable and often leads tours in Alabama, Tennessee, and Georgia. He has also received a number of patents for inventions during his time as an engineer. One of the things that I appreciate about this book that it not only looks at Forrest, but looks at the battles and campaigns which surround him. Being part of the Western Theater of the war, one of the issues I have is that there are a great deal fewer works on those engagements than the Eastern Theater. Throughout the book, Gen. Scales presents the engagements in each chapter. Sometimes they even read as though they area guide to anyone interested in visiting the battlefield. It almost feels as though he is taking the reader through the field himself in a way that I have not read in the past few years. His cumulative review of the raid or battle at the end of each chapter is also quite insightful as Gen. Scales excels at the narrative in this book. Aided by some fine maps and photographs, this book not only is a great insight into Forrest, but into the west. For those readers looking for a deeper book into the life of Forrest, you will find some interesting reading here, but the focus is more on the battles and raids which Forrest conducted during his military career. I highly recommend this book, not only as a look into Forrest himself, but into the Western Theater of the Civil War. I found that Gen. Scales not only brings those battles to life, but walks hand in hand with you on the trails to point out the importance of certain things never pointed out before. Forrest may be a character deeply steeped in controversy, but this book puts that aside and instead focuses on his military career instead, even giving you glimpses into other commanders who surrounded Forrest. Overall, if you are interested in the Western Theater of the war, this book is highly recommended.